My preschooler turns 4 at the end of this month. She’s just beginning to take interest in ‘doing school’ like her big siblings, so my first goal is to teach her to recognize the alphabet. When S is for Smiling Sunrise, came for us to review she could not believe a ‘school’ book came in the mail just for her! This adorable full-color hardback book with audio CD included is written by Vick Wadhwa and published by WordsBright. The song can also be downloaded as an MP3, so you and your child can listen to the it anywhere! The song is not a required part of reading the book and doing activities with your child, but it definitely adds to the interest. Thankfully, the song goes with the traditional ABC song tune, so after hearing it a few times, it’s easy to read the book with your child in a sing-song voice to the ABC tune. Two teaching guides for teachers and/or parents are available as electronic downloads with purchase of the book. The book itself is a great addition to any toddler, preschool or kindergarten library. Each page is dedicated to one letter. Each page has the same setup, which I think is perfect for teaching letter recognition. My preschooler quickly learned where to find the upper and lowercase of each letter. In between the upper and lowercase letters, the target word is printed (Such as ‘Sunrise’ for S). The rest of the page is dedicated to an illustration of the target word and a poem. Click over to the ‘look inside’ page to get a better idea of the content of each page. 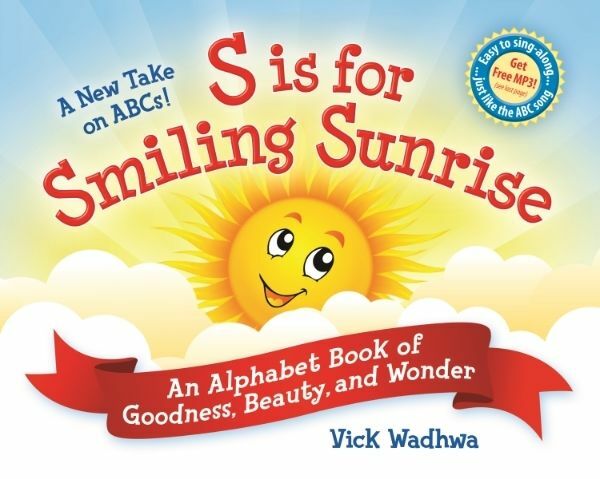 S is for Smiling Sunrise is an adorable, fun book for preschoolers working on alphabet recognition! Previous Post: « 9 Fun Board Games for Kindergarten- that Mom will Enjoy Playing too!